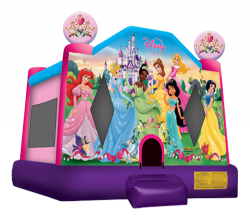 The beauty of Disney's princesses is a sure draw with this fun licensed Disney Princess 2 medium jump, a bouncy house with a bit of nobility. Participants are welcomed by Ariel, Cinderella, Tiana, Belle, Jasmine, Aurora and Snow White, ready for the ball. Visitors will rule this bouncy house kingdom, with plenty of room for bouncing fun all day long. This Disney Princess 2 bouncy house features a pair of 3-D princess toppers, along with beautiful artwork fitting for royalty. 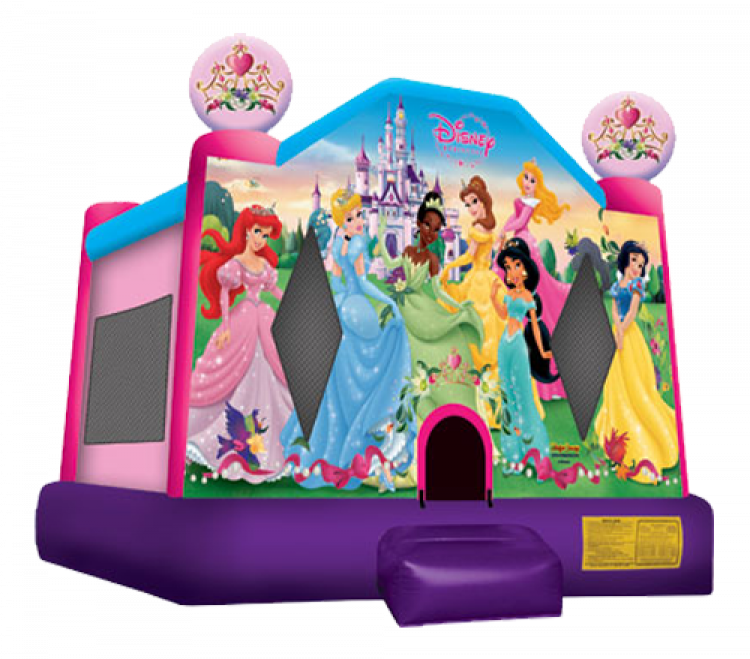 This licensed Disney Princess 2 medium jump is part of a line of Disney Princess 2 products, with larger jumps, Combos and 3-D combo bouncy houses.The inflatable jumper is the perfect way to combine fun and healthy activity, and will add value to any Party Rental or Indoor FEC! With a variety of colors, shapes and themes, our moonwalks offer kids of all ages exciting aerobic activity. This jumper has 360-degree mesh windows, so parents and spectators can have a clear view of all the fun. Our bouncy castles are made safe and secure with lite n strong, fire-resistant vinyl making it safer, portable and more durable.